Prior to Version 3.2.0 CD exports were 'hard coded' meaning there was no possibility for the user to edit the exports or create new ones. CD exports as now performed from File>Export are defined by XML files stored on the users computer. These XML files are editable and new XML files may be defined by the user. Please note document editors such as Microsoft Word and Write are not plain text editors and should not be used. Furthermore please be aware most Windows computers associate XML files with Internet Explorer and therefore simply double clicking the XML will open the file in Internet Explorer rather than the text editor. To change this simply right click on the XML file, select "Open with.." and open the file with your preferred text editor. The exports are therefore computer specific. New XML files must be copied to this location on all computers in order to be available to all users. The XML files are read when launching the program and subsequently displayed in the File>Export ... module. It is therefore important to note that when a new XML file is added to the above location the program must be re-launched before the export is available. Likewise if an existing export is modified, the program must be re-launched before the changes are effected. Each XML file contains a series of attributes or elements that define a specific portion of the export such as the export name, category, image properties, text file etc. Each of these elements is definable by the user and many are optional. 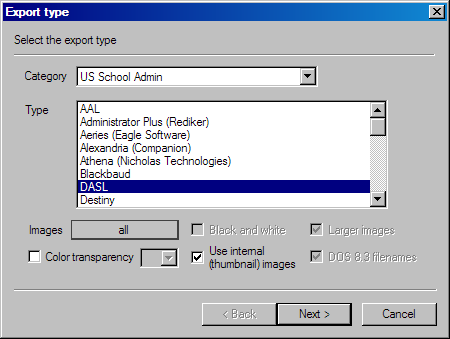 When defining a new export, it is suggested to use a pre-existing XML file as a guide, making alterations as necessary then saving the file with a new name. To assist in the understanding of the XML file a pdf document is available. Exports are run in File>Exports ... from any Mode other than Design Mode. The export module allows the user to select the desired export along with a host of options including the output path for the export. Note not all options are available for all exports.